Gary Thomas issues a passionate manifesto of faith fully alive. The Beautiful Fight calls us beyond mere sin-avoidance to a robust holiness that radiates Christ through every aspect of our being. To see with Christ's eyes, feel with Christ's heart, and serve with Christ's hands - his is what Christianity is truly about. ^^^In a groundbreaking book that rethinks spiritual formation, Gary Thomas argues that the contemporary church is in danger of accepting Christianity as a historical reality but not as a present power. Is the grace that pardons powerful enough to transform? Answering with a resounding yes, Thomas presents a compelling picture of what it means to be a "God oasis" in a God-forgetting world. ^ ^"The first chapter alone is worth reading many times. This is beauty and struggle.^ ^This is the death that leads to life." ^^ ^The Beautiful Fight will energize your life and your church. It will inspire you, equip you, and challenge you to delve ever deeper into what it means to be a truly holy believer, transformed into the image of Jesus Christ. Discover just how radical Christian transformation can be, as you learn to see with new eyes, think with a new mind, and feel with a new heart. Thomas rallies you to the Beautiful Fight the struggle to fully express the wonder and life-changing power of Christ in this world through every aspect of who you are. True Christian faith is a profoundly transformational experience in which every part of our being is marked by God's change and energized by his presence. This transformation takes us far beyond mere sin avoidance to a robust 'full-bodied' holiness in which we make ourselves 'holy available' to God every minute of the day. From Starbucks, to the office, to the soccer fields, to the boardroom, believers have the opportunity to carry the presence of Christ wherever they go. God offers the reader more than mere forgiveness; he wants to radically change and fill them with his presence, so they can experience an entirely different kind of life based not just on what they do or don't do but on who they are. Yet while many Christians today profess belief, their Christianity has no pulse. 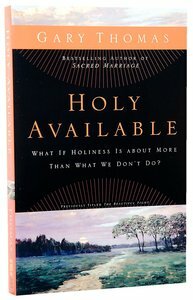 Holy Available is a manifesto of fully alive faith. Gary Thomas issues a compelling call for readers to see with Christ's eyes, feel with Christ's heart, and serve with Christ's hands. We make ourselves available to become 'God oases,' places of spiritual refuge where God can bring the hurting and lost to enjoy his presence and ministry. His books and ministry focus on spiritual formation: how we can integrate Scripture, church history, and the time-tested wisdom of the Christian classics into our modern experience of faith. Most recently he has produced Every Body Matters: Strengthening Your Body to Strengthen Your Soul. Order now to secure your copy when our stock arrives. 0 Available. Expected to ship in 6 to 7 weeks from Australia.